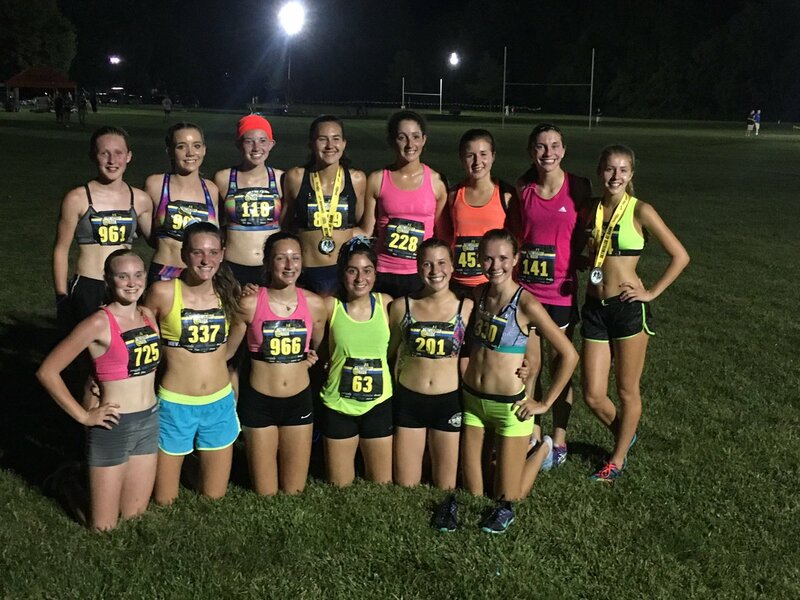 Fourteen girls traveled to Peoria to compete in the 2016 Detweiller at Dark race last night. The conditions were still tough at the 9:15 pm race time with temps in the low 80’s, but the humidity was off the charts. Despite the weather, the girls performed very well (July 22 Detweiller at Dark 2016). While the official 2016 does not begin until August 10, team scores were calculated based on the various high school teams all the girls compete for. The team from Carmel, Indiana, a perennial top 10 team in the nation, made the trip to Peoria to compete and took home 1st place honors. Yorkville, an Illinois powerhouse, finished 2nd. A team made up of recent Yorkville and Oswego graduates combined to take 3rd. DGS was divided into two teams of 7 runners each, and the DGS Blue team placed 4th, while the DGS White team place 16th out of a total of 28 competing teams. See full team scores here: July 22 Detweiller at Dark Team Scores 2016. Becky Versaskas (So) and Katie Stapleton (Sr) led the Mustangs with their top 25 finishes (15th and 23rd respectively). Video highlights from the race can be found at DyeStatIL. Additional pictures from the race can be found on the Pictures and Video page. 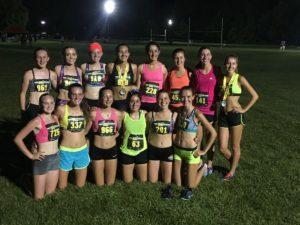 The girls will complete the last week of summer cross country camp this week and then have a week of captain’s practices before the season begins on Wednesday, August 10th. The 2016 spirit wear online shop is open from now until July 31st. Any girl who plans on participating in DGS Girls Cross Country this season should attend the 2nd annual team camping trip on August 11-13. Visit the camping trip page to access registration and trip info. If you cannot attend the camping trip, please let Coach Plunkett know as soon as possible. The 2016 DGS Girls Cross Country season will begin on Wednesday, August 10th. The first practice will be held from 7:00-9:30 am at DGS (outside of Exit 6). On August 11th, the team will leave at 7:00 am for a camping trip at Rock Cut State Park, returning by noon on Saturday, August 13th. Registration for the 2016 season is OPEN now and can be accessed through the DGS Athletics website. In addition to registration, each athlete must have a valid sports physical prior to August 10th. Please do not wait until the last minute to register and/or attempt to get a physical. There are a lot of important things happening in the world of DGS girls cross country, both this summer and in the fall! Thursday, July 7th: Team Pool Party/Bonfire at Olivia’s house. 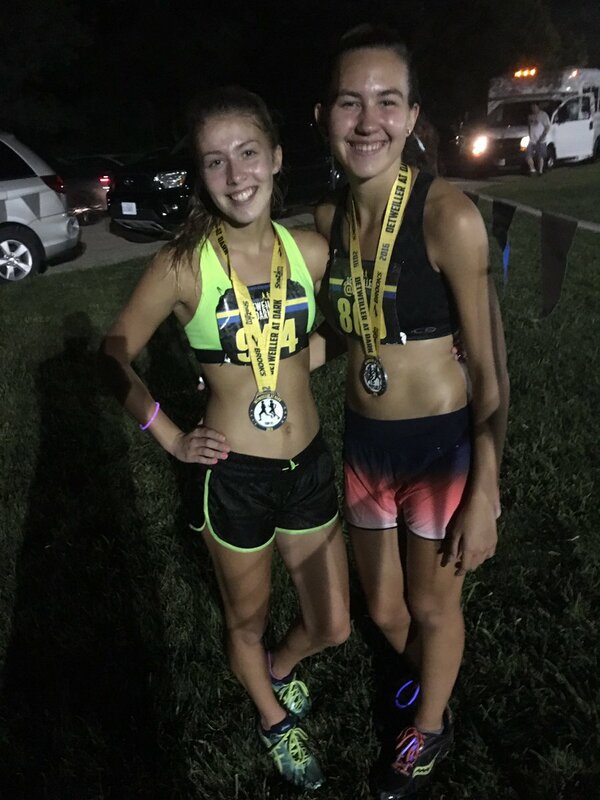 Saturday, July 9th: Saturday run hosted by Allison and Clare. Tuesday, July 19th: Movie Night at the track. Friday, July 22nd: Detweiller at Dark race. Saturday, July 23rd: Saturday run hosted by Riya. Thursday, July 28th: Pool Party/Lunch hosted by Clare and Riya. Saturday, July 30th: Saturday run hosted by Emily. First week of August (exact day TBD): Team BBQ hosted by Katie. Saturday, August 6th: Saturday run hosted by Olivia. Additionally, the season will officially begin on Wednesday, August 10th. You must get a valid sports physical and register online BEFORE August 10th. Registration will be through DGS 8to18 website that you can access from the DGS Athletics page or click on the previous link. We will also leave for our Team Camping Trip on Thursday, August 11th. The cost for the trip is $75 and it must be paid by Friday, July 29th. This must be done on the DGS Web Store. Author Coach PlunkettPosted on July 6, 2016 Categories Cross CountryLeave a comment on Important CC Info!